Saturday morning, at the Lienz railway station we jump in the shuttle buses for Obertilliach under a dismal drizzle. Yesterday the tracks were grand; what will remain of them to-day? Thirty km later the rain becomes snow. 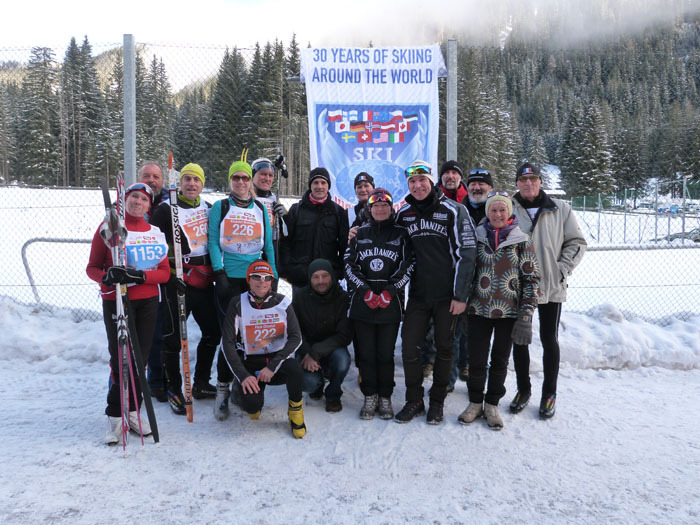 In Obertilliach it really snows, but a snow at zero degrees: the worst for a classic race. The SWIX stall suggests VR75… intended for very warm fresh snow (+2 or +3 °C!). The most safety-minded take their no-wax skis, the best roughen their skis. And off it goes. A splendid course that I didn’t yet know, without those former zig-zags on the meadows, but a very clever triple loop which takes us up to the highest point of the valley and allows that the first never overtake the slow skiers. Bravo! in spite of two short but severe climbs at around 30 km. Fortunately, a TOKO stall rewaxes the skis in a matter of seconds: it sticks a little but allows me to ski uphill without slipping backwards, although it gives a reduced glide on the return track. In conclusion a very beautiful course but with a wet snow that continues falling and freezes fingers and bones. The tracks remain correct… until a snowmobile of the press destroys them, filling our lungs with exhaust gas with an ear-splitting noise. I suggest that in case of difficult track conditions snowmobiles be forbidden if they don’t serve for the safety. In short: the Purgatory. 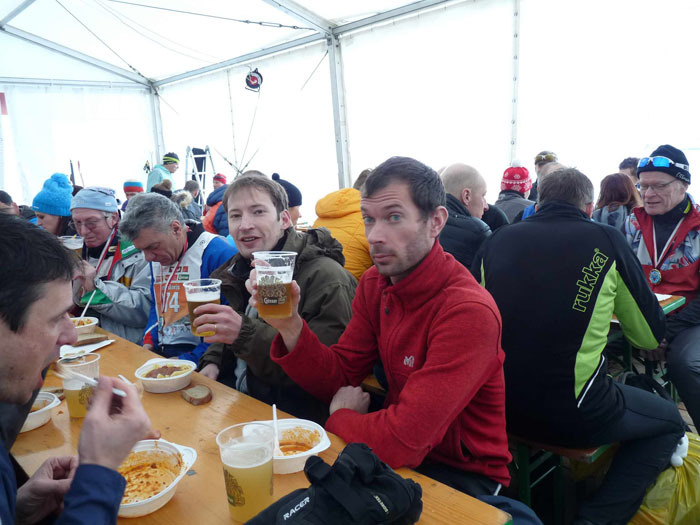 But: at the finish an excellent goulasch soup, a piece of tart and beer, all in a cosy warm tent. Thanks to Dolomitenlauf for pampering us. Sunday morning, at the Lienz railway station, we jump in the shuttle buses for Obertilliach (no snow in Lienz as in many previous years, thus no regular 65 km skating race, a pity) under a splendid sun and a negative temperature. The same course as the previous day (with more champions in the first line) but with a well groomed, good glide snow, and we wear sun glasses instead of rain shields. This changes everything. 42 km of happiness (in reality 39 km, why not announce it officially?). We have even the time to admire the scenery. In short: the Paradise. And nevertheless the same pleasure to find soup, goulasch, a tart or youghurt and beer. Many thanks to Dolomitenlauf, cheers for the perfect organization in spite of adverse conditions. A splendid course that makes us forget the awful zig-zags of earlier events: don’t change it! Add to this a hearty reception of Masters on Friday in Lienz, with a small gift to everyone. In conclusion, don’t miss Dolomitenlauf which merits much more participants than they have. 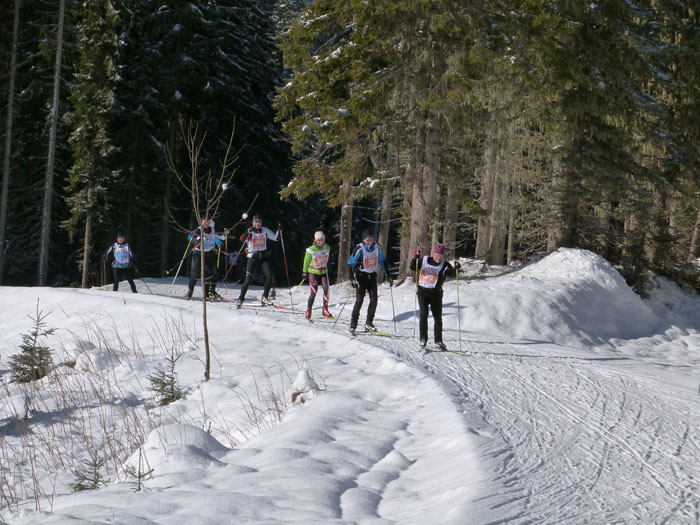 In the Saturday classic race there was a majority of skiers from Nordic countries (Norwegian was more often heard than German) and on Sunday there were more than 20 nationalities. 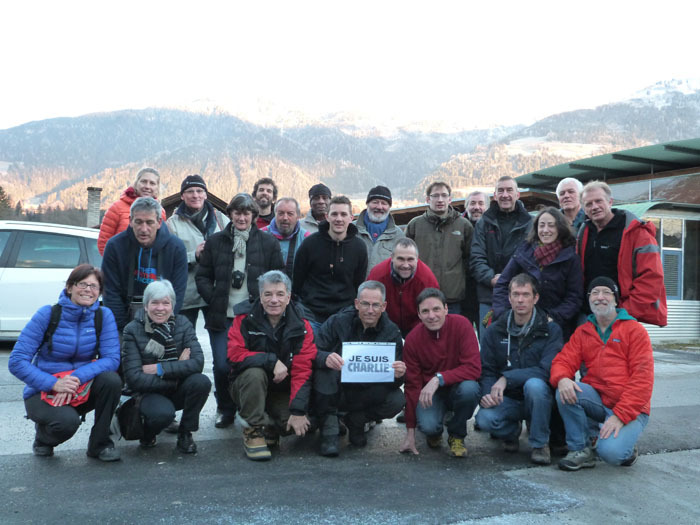 Amongst them a strong delegation of French skiers belonging to the meteorological club Unasacem (28 Worldloppet passport holders) that celebrated a new Master on Sunday: Yannick Bochatay. Pologne : Kamil Zatonski 2.15 ; Suède : Iwana et Joseph Kral 3.26 ; Usa : Jay Wiener 3.48 ; France : Brunilde et Jean Pierre Girardet 2.26 ; Olivier Traulle 2.30 ; Jean Luc Magdinier 2.33 ; Yannick Bochatay et Samuel Vincent 2.39 ; Didier Boutonnet 2.56 ; Boris Petroff 3.10 ; Jean Marc Le Gallic 3.15 ; Diane Osinski 3.17 ; Laurent Merindol 3.29 ; Gérard Maurice 3.32 ; François Giroux 3.34 ; Jean-Pierre Mazard 3.36 ; Chantal Flick 3.56. Canada : Jacques Wrong 1.15 ; Russie : Ludmilia Kolobanova 1.29 ; Slovaquie : Pavol Stanicek 1.56 ; France : Bénédicte et René Vercaigne 1.54 ; Isabelle Petroff 1.59 ; Joseph Luce 2.10. This entry was posted in Race reports 2015. Bookmark the permalink.